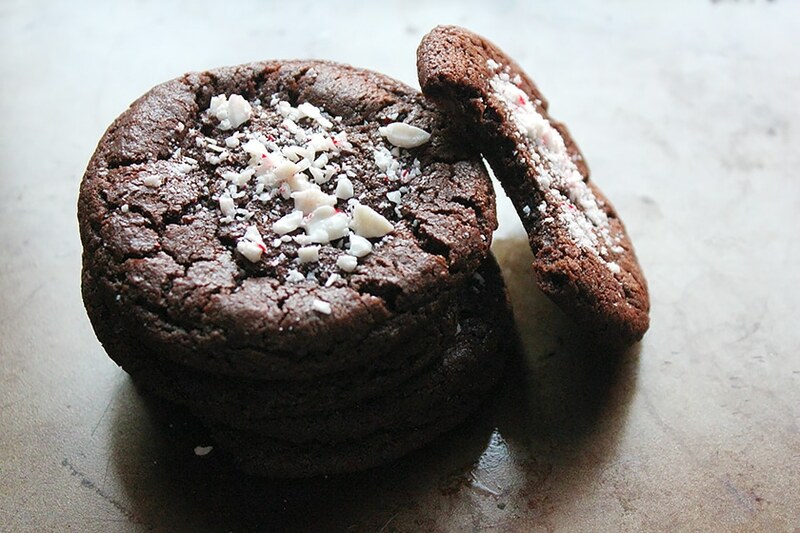 I need to take something off my chest, before sharing my Chocolate Candy Cane Cookies recipe! When I started blogging, I felt lost in the world of food bloggers. 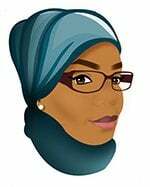 I was a newcomer and wasn’t posting much, nor interacting with other bloggers. I was shy! It took me a lot of courage to leave a comment on fellow food blogger’s post. Then and with time, I met the most beautiful food bloggers. Visiting their blogs is always pleasant, because it felt like meeting them in person (kind of), since they share a glimpse of their lives and what they experience through their posts. I got busy with life, and wasn’t able to interact with my friends online, as much as I wanted to. In addition, I took a long break and missed many of their wonderful posts. I felt like I wasn’t a good friend. 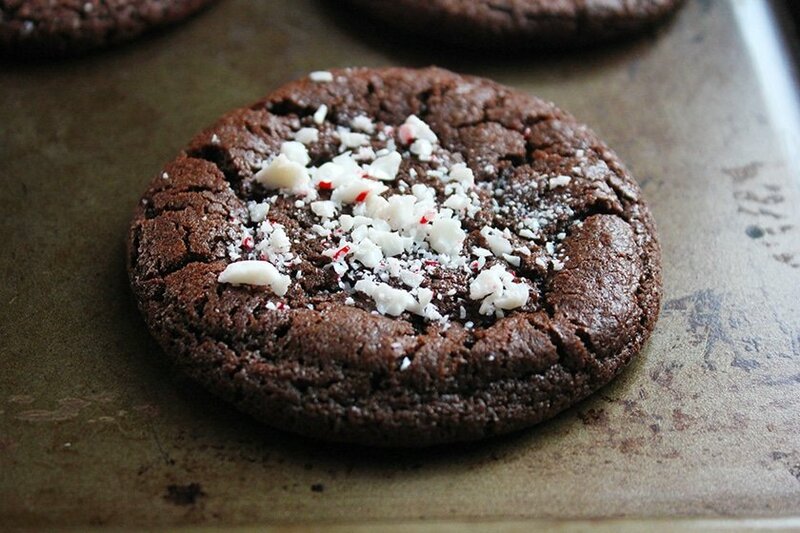 Well, to make up to my foodie food bloggers, I dedicate this recipe of Chocolate Candy Cane Cookies to all of them. These cookies are great while warm, but tastes even better the next day. 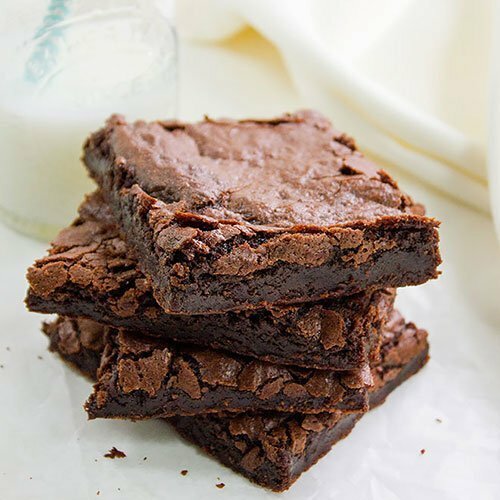 Fudgy, chocolaty, and yummy. With or without a glass of milk, you will devour them in no time. Guaranteed! 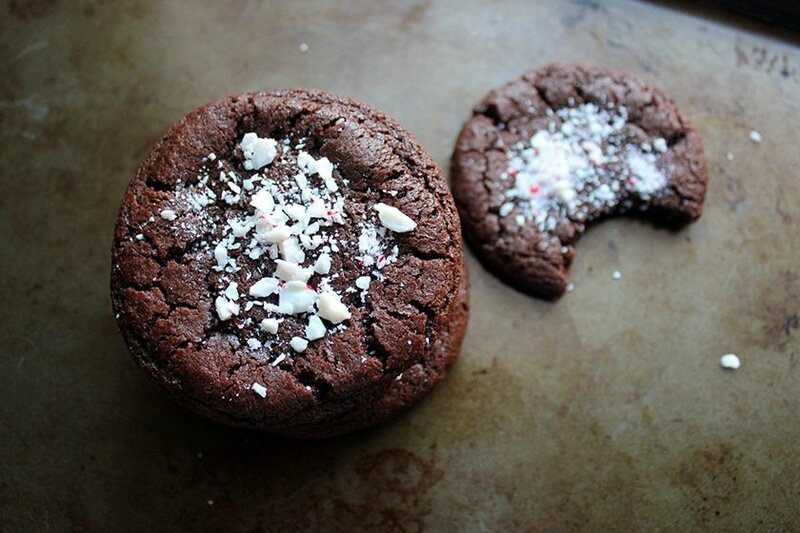 These cookies are great while warm, but tastes even better the next day. Whisk flour, baking soda, salt, cocoa powder, and keep aside. In a bowl, add the butter, chocolate chips, and melt in the microwave for 20 seconds. Add the white sugar, brown sugar, and egg to the butter chocolate mixture and beat well. Add the flour to the wet mixture and mix until combined. Cover and place in the refrigerator for at least one hour. Preheat oven to 350F/180C. Line a baking sheet with parchment paper, or use nonstick baking sheet. Make 16 equal size balls from the cookie dough and place on the baking sheet. Press gently and bake on the shelf above the middle for 10 – 11 minutes. 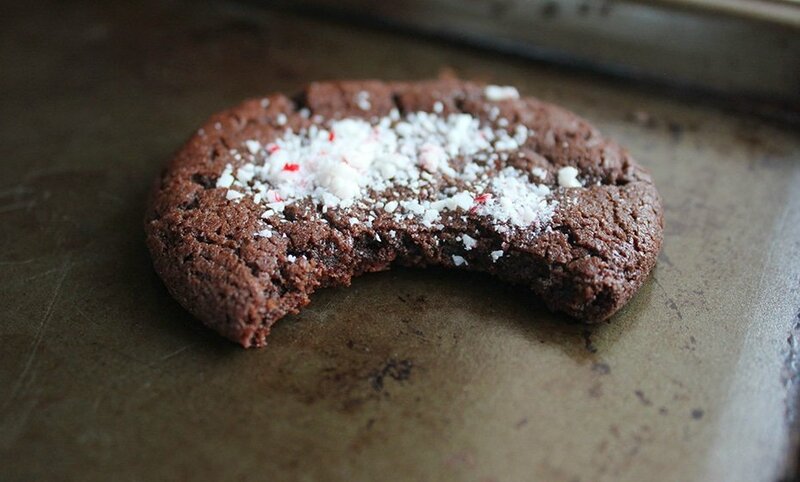 Take the cookies out of the oven, and while hot sprinkle the crushed candy cane. The heat from the cookies will make the candy stick. Note: The dough might be tough when taken out of the refrigerator. If so let it sit at room temperature for 15 to 20 minutes. 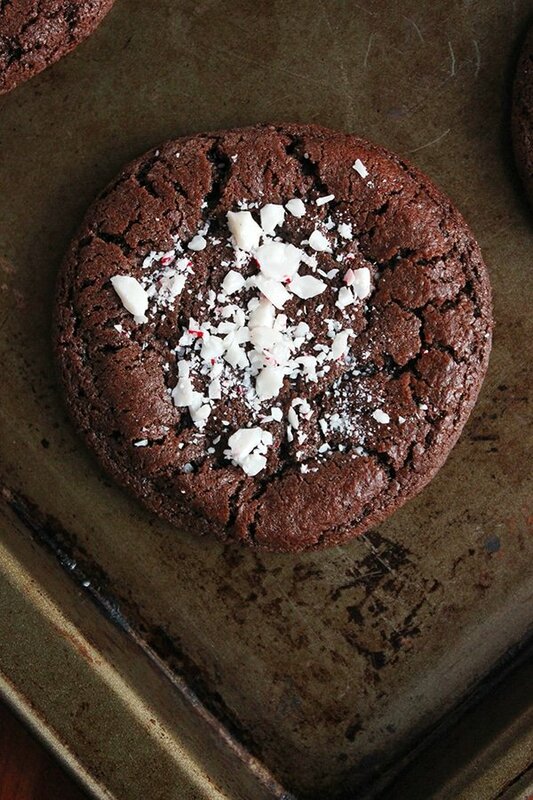 This choc cookies look awesomely fudgy. 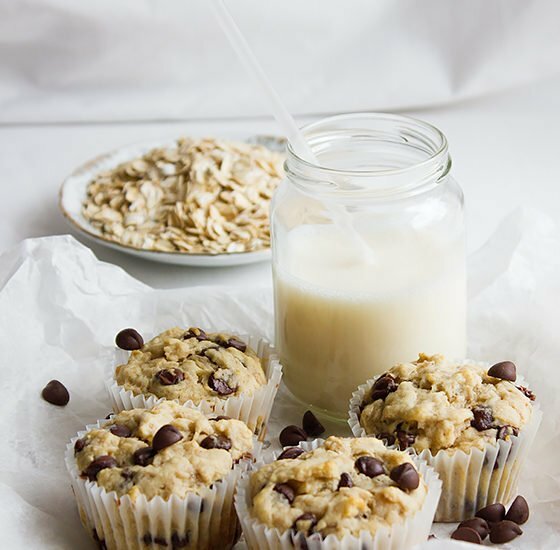 Just found you – I hv to check out your other recipes soon. ?